A sportswriter, Mike Hagen (Gregory Peck, To Kill a Mockingbird), marries a fashion designer, Marilla Brown (Lauren Bacall, The Fan), he hardly knows, and their incompatible lifestyles create all sorts of funny complications. Legendary actors Gregory Peck and Lauren Bacall have always been known for their dramatic performances in stark melodramas. In the 1940s, when both artists’ careers first flourished, they participated in projects that took advantage of their strong personalities. Considering both actors’ filmographies, it is a bit shocking to see them working for laughs in Vicente Minnelli’s goofy romantic comedy Designing Woman. Although I was skeptic at first, I must say that Peck and Bacall succeed in this curious change of pace. Playing incompatible lovers that get married after knowing each other for just a few days, Peck and Bacall are quite amusing in the type of roles typically associated with Spencer Tracy and Katherine Hepburn — in fact, the movie shares lots of things with the Tracy-Hepburn comedy Woman of the Year. Peck, in particular, looks so out of his element that when he bursts into slapstick you can’t help but laugh precisely because it is weird to see him do funny faces. Peck displays a surprisingly good amount of charm and perfect comic timing. Bacall isn’t as funny as Peck, but she is very good indeed. Designing Woman, written by George Wells, is a cute show that doesn’t hesitate in making fun of such sacred American institutions as marriage, fashions, and sports. Being an older title, sexism rears its ugly head, but this is something to be expected from a ’50s comedy. I also thought that the movie was a bit long and some of the subplots were totally unnecessary. 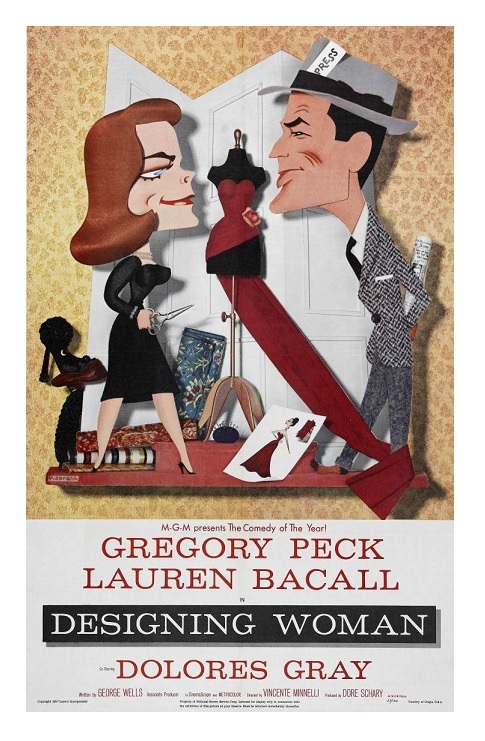 The film is at its best when focused on Peck and Bacall. Designing Woman is based on an idea by famed costume designer Helen Rose (The Bad and the Beautiful). James Stewart (The Philadelphia Story) and Grace Kelly (High Noon) were the first choices for the main roles, but Kelly’s early retirement changed everything. In an interesting move, producer Dore Schary went against the trend, and chose two dramatic actors for the leading roles. The supporting cast is very good too. Dolores Gray (It’s Always Fair Weather), Mickey Shaughnessy (From Here to Eternity), Tom Helmore (Vertigo), Chuck Connors (The Big Country), etc., all actors have plenty of opportunities to shine. Look closely for Dean Jones (The Love Bug) in a small role — he plays the assistant stage manager. Designing Woman is not the best movie of its kind, not even close, but with a group of real professionals in front of and behind the camera, this film has all the ingredients of a fun romantic comedy. If you are a fan of any of the stars you won’t want to pass on this one — it’s a delightful rom-com! Color, 118 minutes, Not Rated.